Since migrating from the concrete squeeze of Hong Kong to idyllic Perth as a ten-year-old, Rina has grown into a colourful composite of scientist, singer-songwriter, and author-illustrator. After a first-class Honours dissertation on a yoghurt bacteria essay, Rina pursued a medical science career firstly in a pathology lab and then as a graduate student. Her doctorate on malaria drug resistance (as Rina P. M. Wong) included various field trips to PNG, and earned her the prestigious JFA-Sprent Medal from the Australian Society of Parasitology. After a break to start a family, Rina returned to earn accolades as a teaching academic for her innovations as an instructor – testament to her enthusiastic and engaging style of science communication. Audiences regularly find themselves enthralled by Rina’s musical talents as she seeks to inspire and ‘edutain’, be they little ones, undergraduates, or grownups. Rina currently balances the thrills of teaching with the spills of mothering two young children, all the while cultivating her inner artist and veggie patch in sun-soaked Perth. 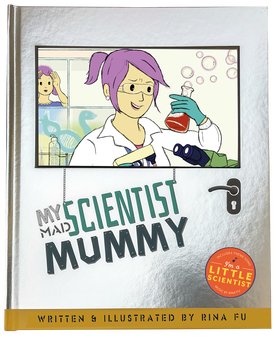 Beginning with her first picture storybook My Mad Scientist Mummy, Rina hopes to use any medium to bring the fascinating world of the microscopic into the imaginations of children and adults everywhere. You can visit her website http://www.rinafu.comfor more information.